PetPaint is easy and fun to use! Please consider your dogs comfort first. With anything new it takes time fo them to adjust. Just press down on the nozzle and you're off. Please keep in mind that although dog-safe, Petpaint should not be sprayed in the eyes, mouth, on open wounds, in cuts or any other tender areas. Spray patterns can be adjusted with distance from animal. Use stencils for nice detailed edges, shapes nad symbols. 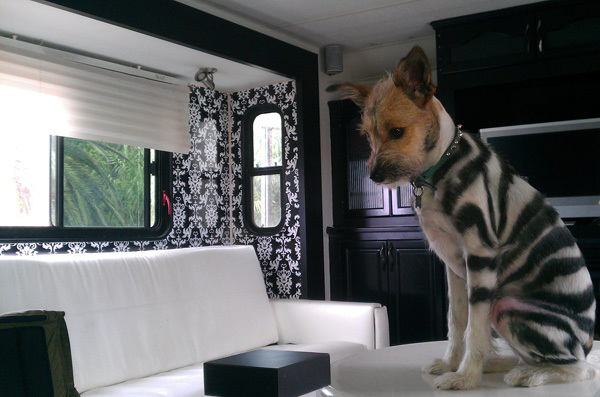 Use your dog's natural color patterns to accent your design. For brilliant color on dark animals spray white first then your final color over the white base.